The Google Nexus 8 release date and specs are being heavily rumored. What can we expect from the powerful next-gen flagship? Which is still one of the best tablets around. Read this article to get details. The Nexus 8 release date is somewhat up in the air with initial rumours saying that it would be announced in July and would not make an appearance at the Google I/O developer conference, despite an unknown device being shown on the website for the event (main image). Google has hinted at different prices of $399 for the 16GB version and $499 for the 32GB version of the Nexus 8. This is much higher price range than the previous two Nexus tablets and it shows us where Google might be pricing the new Android Silver devices. In terms of Nexus 8 specs we should take a look at Nexus 7 2 specs first. The Nexus 7 2 is expected to have a 7-inch 1890 x 1200 LED display, a Qualcomm Snapdragon 600 quad-core CPU processor, 2GB RAM, 32GB internal storage, a 5MP rear camera and 1.2MP front-facing camera. The OS is expected to be Android 4.3 Jelly Bean. 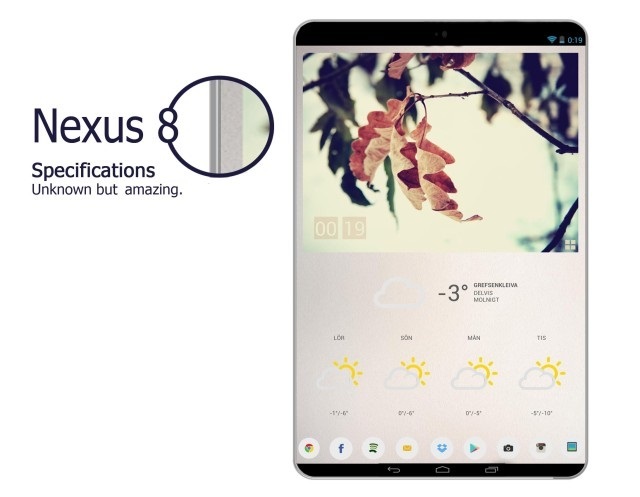 Naturally we can expect the Nexus 8 specs to be an improvement over Nexus 7 2 specs. The latest scuttlebutt says we can expect a 64-bit chip powering the newest Nexus tablet. AndroidPit reports that Google’s Nexus 8 will feature Intel’s freshly-announced Moorefield processor. First unveiled at MWC, this quad-core 64-bit CPU is scheduled for availability in the second half of 2014. This chip uses PowerVR G6430 graphics. Interestingly, during the unveiling of Merrifield and Moorefield, Intel confirmed that Asus, along with Dell, Lenovo and Foxconn, had agreed to multi-year partnerships to use the chips. This is speculation, but every Nexus device has launched alongside a new version of Android. Google has always treated the Nexus line as a way to showcase the new features and interface of its newest operating system version. We do not know if it will launch with Android 4.5 or a larger Android 5.0 update. That’s all we know about the Nexus 8 for now, but stay tuned. We’ll update this article on a regular basis as we learn new things.